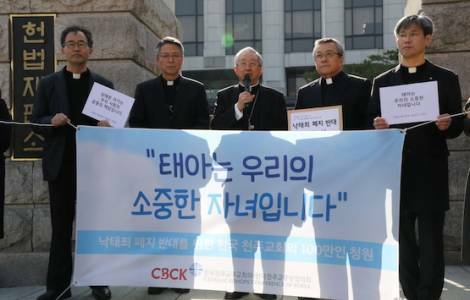 Seoul (Agenzia Fides) - Korean Catholics march in defense of life: this is the spirit of the "March for Life", an event held on the streets of Seoul on 16 June to say "no" to the legalization of abortion and reaffirm the commitment to the protection of human life. The Korean people are awaiting the decision of the Constitutional Court on the constitutionality of the law that prohibits abortion in South Korea. As Fides learns, those present at the "March for life" declared the legality and legitimacy of the provision and declared themselves "ready to oppose the abrogation of the prohibition of abortion", in the spirit of defending the life of the mother and child in the womb. Once they arrived at the Cathedral of Seoul, the demonstrators listened to Cardinal Andrew Yeom Soo-jung, Archbishop of Seoul, who addressed the people of Korea with a message that invites them to welcome and respect life. Cardinal Yeom said: "Life, which seems so fragile and insignificant, has an extremely strong power. We are all responsible for the limits and social conditions that force women to make irreversible decisions, but abortion is not the best choice, not even a matter of choice, we should try to build a culture that teaches to respect and love life together".